Also some good news and bad news. The good news: Soul's Journey got an honorable mention in the Excellence in Webcomics Awards. You can vote for the comic in the People's Choice Awards, too - who knows maybe it gets something there, too? Stargazer's Gate: A strange g̸̨̕á͜͜t̛͠e͝ tears Atrina's family apart. 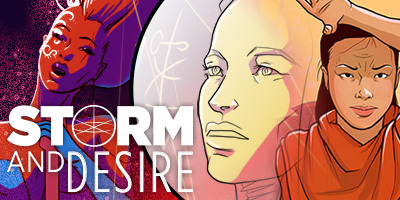 Storm And Desire: Three women’s fates collide as they uncover the secret history of the multiverse.